The Camden International Film Festival announced today its 2018 lineup, which includes 37 features, 43 short films, one episodic series and 20 virtual reality and immersive experiences from over 30 countries. Included among the features are three world premieres: Young Men and Fire, by Kahil Hudson and Alex Jablonski (a latter one of our 25 New Faces); Lana Wilson’s series, The Cure for Fear; and Jane Gillooly’s Where the Pavement Ends. The Opening Night film is Morgan Neville’s Orson Welles doc, They’ll Love Me When I’m Dead. Significantly, the festival is reporting that there’s gender parity across all sections, with half or more of the selections directed or co-directed by women. And, half of the films are made by first or second time filmmakers. The 2018 Camden International Film Festival and Points North Forum will take place September 13 – 16 in Camden, Rockport and Rockland, Maine. For more information, visit the festival’s website. A complete list of the films follows. Angels Are Made Of Light reveals the daily struggles and inner lives of students and teachers at a school in Kabul, Afghanistan during the closing years of America’s longest war. US Premiere, Filmmaker in Attendance. A poetic and textured film that follows four children as they experience the natural cycle of life on a farm, learning the profession of their ancestors with the dream that one day they will take over the farm. US Premiere. In this tale of emancipation and freedom, a young and severely wounded Syrian commander redefines herself after retaking an ISIS-controlled city with her female battalion. US Premiere. Filmmaker in Attendance. Communion Los Angeles explores California’s oldest freeway as it courses from the mountains to the ocean, defining and dividing the communities it is designed to serve. North American Premiere. Filmmakers in Attendance. A story of stolen children and cultural survival: inside the first truth and reconciliation commission for Native Americans. Filmmakers in Attendance. A rare invitation into the world of a young artist dying of cystic fibrosis as he and his family navigate the ominous, sacred, and unmapped journey at the end of life. Filmmaker in Attendance. Through literature and myth, characters from the Faust legend intermingle with the inhabitants on the Oaxacan coast, while attempting to control nature with a never-ending building project. North American Premiere. In 12 weeks, young civilians are gradually moulded into Canadian Armed Forces soldiers, and must adapt to a world governed by its own rules and values. US Premiere. Filmmaker in Attendance. With no ropes or safety gear, Alex Honnold becomes the first person to ever free solo climb Yosemite’s 3,000ft high El Capitan Wall, arguably the greatest feat in rock climbing history. Filmmaker in Attendance. The post-truth era Internet: a mesmerizing echo chamber in which everything – from shopping lists to intimate outpourings, conspiracy theories to innocent holidays and tropical cataclysms – is connected. North American Premiere, Filmmaker in Attendance. Vibrant 16mm footage of John McEnroe’s 1984 French Open final illuminates a fascinating essay on the kinship between tennis and filmmaking. Filmmaker in Attendance. On a small island in the Indian Ocean, forty million crabs make their way through dense jungle to the rugged coast and, finally, to sea. Yet the island’s sublime beauty hides other, darker presences. Filmmaker in Attendance. In a moving portrait of resilience, Maiden chronicles the unprecedented journey of 24-year-old Tracy Edwards and the first all-female sailing crew to enter the Whitbread Round the World Race. US Premiere. Filmmaker in Attendance. A bohemian singer/artist becomes father to his five-year-old niece when his sister’s health deteriorates, and finds himself balancing parenthood with his rowdy nightlife and provocative art. US Premiere. Nadia survived genocide and sexual slavery committed by ISIS and now, at 23, finds herself thrust onto the international stage as the voice of the Yazidi people. Filmmaker in Attendance. Cameras follow the Trans-Siberian gas pipeline from Russia through Europe, chronicling the landscapes through which it passes and the lives that it impacts. Filmmaker in Attendance. Through the eyes of African filmmakers, an unforgettable portrait of Sierra Leone’s heroes as they confront Ebola during the most acute modern public health emergency. North American Premiere. Filmmakers in Attendance. The ancient woods are the place where the boundaries of time melt and everything that exists does not wither or age but “grows into” eternity. Welcome on an endless journey deep into the forests of Lithuania. North American Premiere. A scientist says she’s found the cure for fear, but what are the ramifications–and is it okay to be erasing human emotions? World Premiere. Filmmaker in Attendance. When journalist Assia Boundaoui investigates surveillance rumors, she uncovers one of the largest pre-9/11 FBI terrorism probes, and reveals its impact on her Chicago Muslim-American neighborhood community. Filmmaker in Attendance. Love, faith, and civil rights collide in the south as evangelical Christians and drag queens step into the spotlight to explore the meaning of belief. Filmmakers in Attendance. Holding a mirror to our consumerist culture, the film reaffirms the transcendent power of art and the deep need for it in our lives. Filmmaker in Attendance. Celebrated conceptual artist Jill Magid sets her sights on an ambitious new project: an exhibition inspired by the visionary Mexican architect Luis Barragán. The only trouble is, one woman in Switzerland owns Barragán’s entire professional archive and the legal rights to any reproduction of his work. Filmmaker in Attendance. Robots are great… except when they kill people and steal jobs. That’s the conclusion of filmmaker Maxim Pozdorovkin’s eye-opening work of science non-fiction. US Premiere. Filmmaker in Attendance. Orson Welles’ final film remains unfinished, locked in a vault for almost four decades. Neville’s take on the archive exposes a dense story of betrayal made up of many fragments of high and low culture. Filmmaker in Attendance. Three young women each have a sought-after commodity – their virginity. Kristina, Karina and Katya each try to make their way in a world ruled by fame, popularity and money. Filmmaker in Attendance. If we want to live in democracy, we must first ask what the word even means. What Is Democracy? connects past and present, emotion and the intellect, the personal and the political, to provoke and inspire. US Premiere. Filmmaker in Attendance. Beginning with a 1960s roadblock that divided then-white Ferguson from black Kinloch, the film depicts a micro-history of race relations in America. World Premiere. Filmmaker in Attendance. 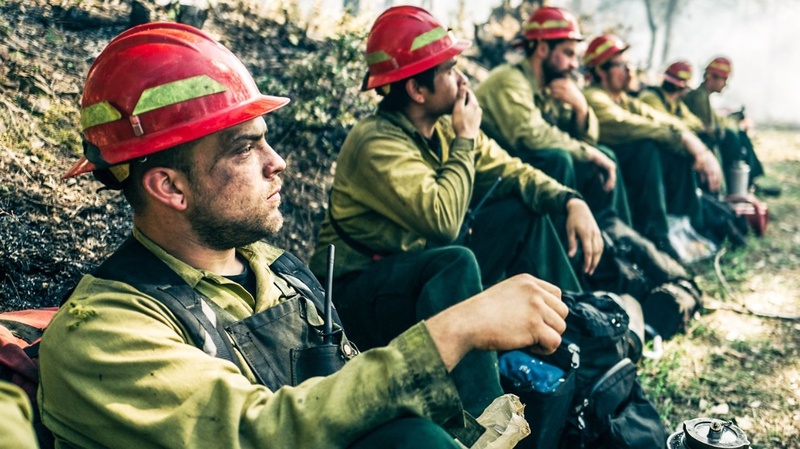 A wildland firefighting crew struggles with fear, loyalty, dreams, demons: a story of working-class men’s exterior world, interior lives and the fire that lies between. World Premiere. Filmmakers in Attendance. Young Solitude is a coming of age film on the words exchanged between young people aged seventeen who are learning to look at each other, to listen to each other, to deal with each other’s entangled stories. US Premiere. Hundreds of letters sent to Ms. Magazine in the 1970s – the ﬁrst mainstream feminist magazine in the US – are resurfaced from the archive and read aloud by strangers in communities across the country. Filmmaker in Attendance. One of the first VR pieces ever created by a Native American filmmaker, Eagle Bone (“Ch’aak’ S’aagi”) combines freestyle spoken word and lush Pacific Northwest scenes in a journey of remembrance and reflection on the lessons of the old ones.